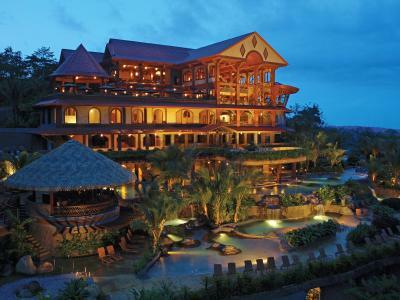 Lock in a great price for The Springs Resort & Spa at Arenal – rated 9.5 by recent guests! Beautiful property, gorgeous healing hot springs, once in a life time experiences—zipline, animals, hanging bridges and impeccable super friendly staff. A fabulous place. We felt safe and secure at all times, and we slept well in a quiet room on a large comfortable bed in the original building. The hot springs are magnificent. During our stay we had no trouble finding private spots and relaxing, even though staff stated the hotel/resort was at 90%capacity. The service was fantastic, they were very helpful. The resort was so beautiful and lots of springs to go into. We ate breakfast there each day of our stay, it was excellent. The staff , and I mean all the staff, was very accommodating and very friendly. Other guests we visited with seemed to be just as satisfied as we were. I didn't notice any unhappy guests. I was pleasantly surprised by all aspects of this property - - the grounds, the staff, the breakfast, the springs, the spa, the fitness center, the concierge, the car/taxi service....we uncovered every stone and loved every minute of it! Gorgeous property with man made hot springs and animal sanctuary on site. Perfect luxurious experience for a relaxing getaway. Beautiful views of the volcano (when no clouds). The property is gorgeous. The room is exceptional. The rooms, restaurants, and amenities at the resort were top notch! The staff was professional, accommodating and present for all our family’s needs. So many fun things to do. The concierge helped arrange our outgo please advise pt to take Fe daily in addition to her PNV. Rx genrated, ty. All were very well organized. Kids ages 10-15. Had so many fun activities on the property as well. A beautiful hotel. Warm and friendly staff. We had a wonderful family vacation. The Springs Resort & Spa at Arenal This rating is a reflection of how the property compares to the industry standard when it comes to price, facilities and services available. It's based on a self-evaluation by the property. Use this rating to help choose your stay! One of our top picks in Fortuna – and a guest favorite. This luxury resort offers spectacular views of the Arenal volcano and valley. It features free WiFi throughout, 18 hot spring pools, a spa and a fitness center. La Fortuna is less than 10 minutes’ drive away. All rooms at The Springs Resort & Spa at Arenal offer panoramic views of the Arenal Valley. They include an extra large double bed, a flat-screen TV, CD and DVD player and an iPod dock. The private bathroom includes toiletries and a hairdryer. The Springs Spa offers a range of massage and beauty treatments, including a floating water massage and body wraps using therapeutic volcanic clay. The changing rooms include a steam room and sauna. The Springs Resort & Spa has 4 restaurants, including a gourmet buffet restaurant, a grill restaurant surrounded by 5 waterfall pools, and a sushi bar. There are also several bars, including a sports bar. An airport shuttle service is also available at an additional cost. The Springs Resort & Spa also offers within the property access to Club Rio Outdoor Center located at 0.9 miles from the resort where you can do River Tubing, Horseback Tours, Rock Climbing and Rapelling. Additional you can access to the Wildlife Preserve for Rescued Animals. 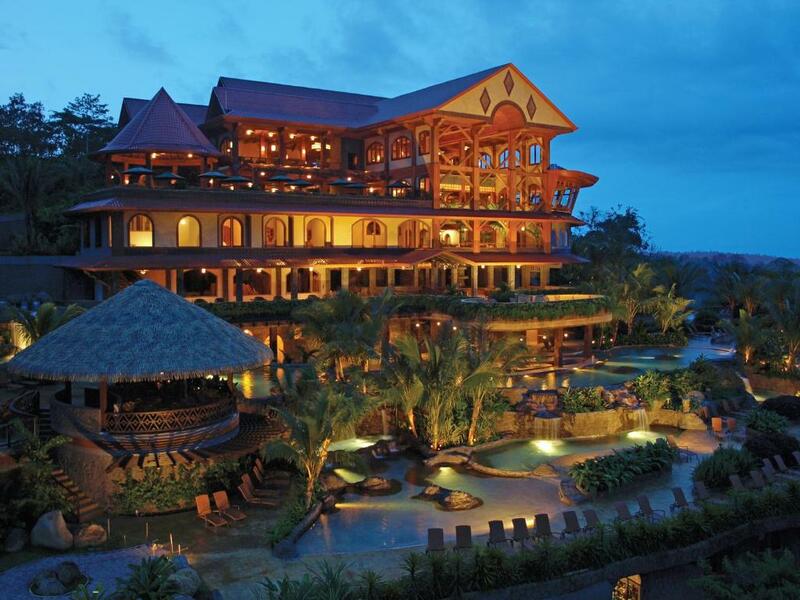 When would you like to stay at The Springs Resort & Spa at Arenal? Spacious air-conditioned room with seating area, balcony and views of the Arenal Volcano. A king-size bed is featured and a double vanity bathroom. Located on the second floor, this suite has two bedrooms and two bathrooms, and volcano views. The master bathroom has a hot tub. This family room has a balcony with spectacular view of the Arenal volcano, hot tub in the bathroom, and a full media package including Apple TV, Netflix, and Internet TV Channel Package. House Rules The Springs Resort & Spa at Arenal takes special requests – add in the next step! The Springs Resort &amp; Spa at Arenal accepts these cards and reserves the right to temporarily hold an amount prior to arrival. The Springs Resort & Spa at Arenal accepts these cards and reserves the right to temporarily hold an amount prior to arrival. Breakfast price is USD 20.85 per person. Please note that there is a penalization in case the deposit is refunded of 10% of its total cost. There are four restaurants on the property. One of the two areas in need of an upgrade for such a classy establishment is the kitchen management throughout the complex. Food quality is uneven and service is uniformly inattentive and slow. The second area of concern is lack of facilities for mobility impaired individuals. The single small elevator does not reach all resort floors, including guest rooms; besides, twice during our four night stay it was not working. To compensate, the staff cheerfully offers and provides prompt golfcart pickup services upon request. The location is about a fifteen minute drive into La Fortuna on a road one should not drive at night. Also, during our stay we never saw Arenal Volcano's summit due to cloud cover despite visiting in the dry season; a traveler has to expect such disappointments. Price of beverages, cocktails and water was high but food was very reasonable. The place is very far to the airports it’s in the middle and very expensive to get a transfer. Cost 180-200 US so it made it a very expensive trip. The room cost a lot and I had to cancel a night and they only refunded half of a night. The saying it only costs a colones more to go first class could be applied . This is not the least expensive resort , but from what I observed, it is the place to stay in this area. The mattress is very uncomfortable. Cet endroit correspond à la définition du paradis ! I have never had better service than in this hotel. A real 5 star one. At the reception, you receive bracelets telling them the reason of your visit. Ours was red because we were staying there for our honeymoon. Every single person of the staff congratulated us for our honeymoon! The room was splendid - huge with a view on the Arenal Volcano that we could never forget! They organise amazing activities with good value for money - we did 3: safari float, horse riding and Volcano hike - loved it! Got horrible food poisoning from an onsite restaurant which ruined 2 days. Need to be an active traveler, Mountainside hotel! Impressive property! The view, the rooms, the restaurants were exceptional! The prices for drinks are expensive but other than that- everything is perfect! This is a truly exceptional property. The rooms are large, very well appointed, clean and have great views of the volcano. It is a shame that the resort has animals locked away in their mini-zoo. Most of them looked quite apathetic is there just isn t much to do in a small cage. While not outrageously expensive, prices for meals are at the high end (and do not include sales tax and service tax). Finally, while the spring pools are lovely, the murky water makes it hard to see the rough-edged steps leading into them. Sturdy swimming socks are highly recommended - especially after sunset! Great views of the volcano (clouds permitting). Lots of things to do within the resort, so it does not get boring, especially when you have a car or other means to visit nearby attractions. Beautiful nature - the resort is well maintained and there are nice walkways in their "Club Rio" to immerse in the green.